Regional variations in sea surface temperature, related to seasons and El Niño, could be crucial for the survival of coral reefs, according to our new research. This suggests that we should be able to identify the reefs most at risk of mass bleaching, and those that are more likely to survive unscathed. Healthy coral reefs support diverse ecosystems, hosting 25% of all marine fish species. They provide food, coastal protection and livelihoods for at least 500 million people. But global warming, coupled with other pressures such as nutrient and sediment input, changes in sea level, waves, storms, ventilation, hydrodynamics, and ocean acidification, could lead to the end of the world’s coral reefs in a couple of decades. Read more: How much coral has died in the Great Barrier Reef’s worst bleaching event? Climate warming is the major cause of stress for corals. The world just witnessed an event described as the “longest global coral die-off on record”, and scientists have been raising the alarm about coral bleaching for decades. The first global-scale mass bleaching event happened in 1998, destroying 16% of the world coral reefs. Unless greenhouse emissions are drastically reduced, the question is no longer if coral bleaching will happen again, but when and how often? To help protect coral reefs and their ecosystems, effective management and conservation strategies are crucial. Our research shows that understanding the relationship between natural variations of sea temperature and human-driven ocean warming will help us identify the areas that are most at risk, and also those that are best placed to provide safe haven. Bleaching happens when sea temperatures are unusually high, causing the corals to expel the coloured algae that live within their tissues. Without these algae, corals are unable to reproduce or to build their skeletons properly, and can ultimately die. The two most devastating global mass bleaching events on record – in 1998 and 2016 – were both triggered by El Niño. But when water temperatures drop back to normal, corals can often recover. Certain types of coral can also acclimatise to rising sea temperatures. But as our planet warms, periods of bleaching risk will become more frequent and more severe. As a consequence, corals will have less and less time to recover between bleaching events. We are already witnessing a decline in coral reefs. Global populations have declined by 1-2% per year in response to repeated bleaching events. Closer to home, the Great Barrier Reef lost 50% of its coral cover between 1985 and 2012. While the future of worldwide coral reefs looks dim, not all reefs will be at risk of recurrent bleaching at the same time. In particular, reefs located south of 15ºS (including the Great Barrier Reef, as well as islands in south Polynesia and Melanesia) are likely to be the last regions to be affected by harmful recurrent bleaching. We used to think that Micronesia’s reefs would be among the first to die off, because the climate is warming faster there than in many other places. But our research, published today in Nature Climate Change, shows that the overall increase in temperature is not the only factor that affects coral bleaching response. In fact, the key determinant of recurrent bleaching is the natural variability of ocean temperature. Under warming, temperature variations associated with seasons and climate processes like El Niño influence the pace of recurrent bleaching, and explain why some reefs will experience bleaching risk sooner than others in the future. Our results suggest that El Niño events will continue to be the major drivers of mass bleaching events in the central Pacific. As average ocean temperatures rise, even mild El Niño events will have the potential to trigger widespread bleaching, meaning that these regions could face severe bleaching every three to five years within just a few decades. 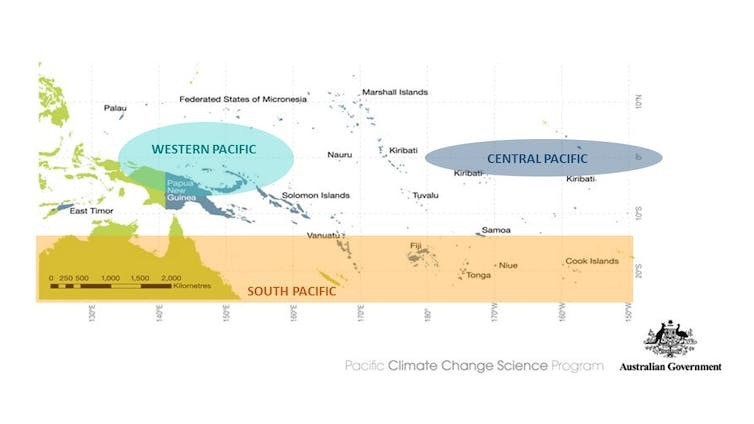 In contrast, only the strongest El Niño events will cause mass bleaching in the South Pacific. In the future, the risk of recurrent bleaching will be more seasonally driven in the South Pacific. Once the global warming signal pushes summer temperatures to dangerously warm levels, the coral reefs will experience bleaching events every summers. In the western Pacific, the absence of natural variations of temperatures initially protects the coral reefs, but only a small warming increase can rapidly transition the coral reefs from a safe haven to a permanent bleaching situation. One consequence is that, for future projections of coral bleaching risk, the global warming rate is important but the details of the regional warming are not so much. The absence of consensus about regional patterns of warming across climate models is therefore less of an obstacle than previously thought, because globally averaged warming provided by climate models combined with locally observed sea temperature variations will give us better projections anyway. Understanding the regional differences can help reef managers identify the reef areas that are at high risk of recurring bleaching events, and which ones are potential temporary safe havens. This can buy us valuable time in the battle to protect the world’s corals. The optimistic view that some species will survive, due to warming water & increasing salinity to me seems closing the gate when the horses have bolted. After recent warming and cyclone destruction we have lost species,probably forever. From a perspective if you sum the onshore effects Volume of tides and currents over time they would far outweigh the onshore effects of terrestrial run-off. Why then do we persist with the “Save the Reef “mantra” its degradation is reaching(If not already reached ) the tipping point of no return. I say build the bloody ark, get on with it ! a series of land based well constructed facilities would not only provide some salvation for species under threat but also provide employment , some spin off for tourism , and most of all stop the headlong rush to oblivion! I wish we had two hundred years for these adaptive migrations to take place. As can be seen from the graph, the GBR will be under almost continuous bleaching distress by the middle of this century. Did coral reefs survive earlier massive increases in CO2 and temperature changes which were far slower than our current event? There is some evidence that they did not do well. I don’t see any consideration to adaptation and migration. Much literature shows that corals and their symbionts have capability for biological adaptation to underlying SST warming rates of less than 1 degree per 100 years. In instantaneous terms, the GBR daily water temperature maxima range is about double the centennial warming rate and varies from about 29 C in the north to 27 C in the south (AIMS data). And, re Hume et al (2015): “…in the Persian/Arabian Gulf … corals are able to cope with exceptionally high seasonal temperature maxima (34–36°C)…”. Clearly, with global warming there is potential for a more exotic biota on the GBR. That potential includes the capability for currently adapted northern species such as in the warmer more prolific Coral Triangle to migrate to the south over the next two hundred years without stress at the current global warming rate (even without further adaptation occurring throughout). An interesting case is the big isolated Scott Reef lying 250 Km off WA which experienced 80% bleaching mortality in 1998. Excellent recovery was reported from only 9% to 44% cover, after only twelve years (that being over double the 2015 GBR average cover , even without the GBR’s fecund currents). How will more time help us? This article states 50% of the Barrier Reef is gone already. In 2015/16 Queensland dug out 245 million tonnes of coal and Queensland is in charge of the reef. It really is that simple.